The 21st annual Goodwood Festival of Speed, a thrilling mix of sport and show highlighting the cars of today and tomorrow, came to a close Sunday. A Moving Motorshow allowed spectators to drive production models up the famed 1.16-mile Goodwood hillclimb, while classic and Formula 1 cars, as well as the 2014 Le Mans 24 Hour winner, were on display. Design excellence was a hallmark of the Cartier ‘Style et Luxe’ Concours d’Elegance. And Goodwood also highlighted the crossover between virtual and real, with an upgraded Gran Tursimo 6 to reflect the 2014 hillclimb course and manufacturers exhibiting their new Gran Turismo concepts, for the game’s 15th anniversary. Nissan unveiled its Concept 2020 Vision Gran Turismo, which Chief Planning Officer Andy Palmer said could become a classic car in its own right. “It’s something that was born in virtual reality and it’s come to reality. I think that so well describes the social trends that we see, the millennials, the Gen Zs and how important virtual reality, social media is to those people – those kids now – as they grow up. That’s their norm,” said Palmer. And what would Goodwood be without celebrities? Nissan’s brand ambassadors included London 2012 Paralympic gold medalist Richard Whitehead and Sochi 2014 Winter Olympic bronze medalist Jenny Jones, in Nissan’s partnership with Team GB and Paralympics GB ahead of Rio 2016. Six-time Olympic cycling champion Sir Chris Hoy, who has traded two wheels for four, drove the GT-R Nismo. Hoy crashed at the notorious Molecomb corner, but came back from it unscathed to drive Sunday. 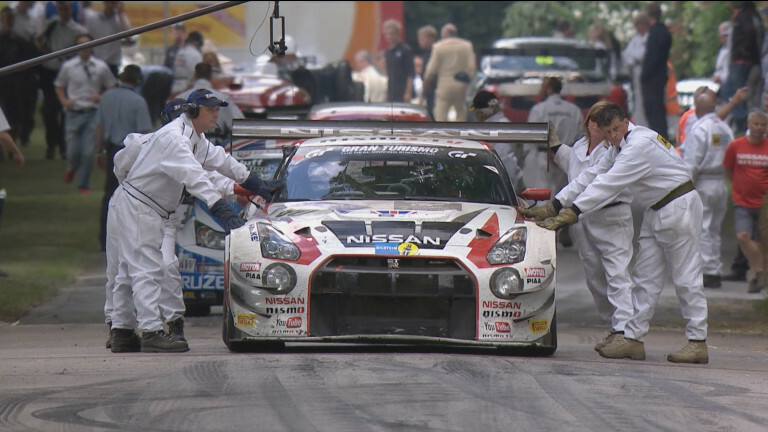 Nismo athlete Jann Mardenborough clocked 48.05 seconds in his very first non-virtual visit to Goodwood, smashing the supercar record and finishing fourth in a Nissan GT-R Nismo. But nine-time World Rally Champion Sebastian Loeb made this year’s fastest hillclimb at 44.6 seconds, still behind the record of 41.6 seconds held by Nick Heidfeld since 1999. Goodwood is an annual road marker that Formula One is about to return with the British Grand Prix, one that underscores a decades-long commitment to automotive innovation and excitement.